Harvey Weinstein's lawyers asked Monday for a chance to question in court the former lead detective in his sexual assault case and the head of New York City's special victims division. 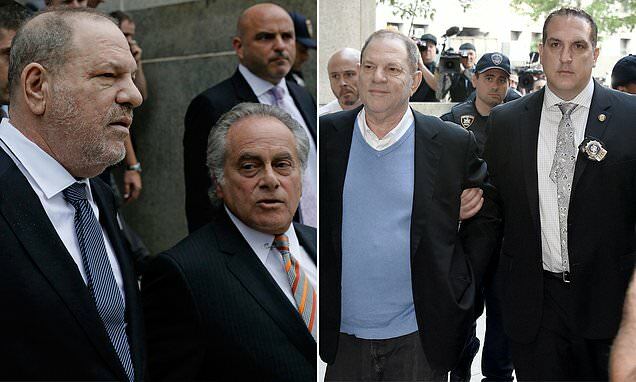 The disgraced media mogul's attorney, Benjamin Brafman, is arguing the case has been 'irreparably tainted' by police misconduct and should be thrown out. They also argued that one of Weinstein's accusers had tried to meet up with him following the alleged assault. The former Hollywood producer's lawyers singled out Detective Nicholas DiGaudio - whose alleged witness coaching led prosecutors to abandon part of the case last month - as they renewed their push to have five remaining counts dismissed. The union representing DiGaudio, the Detectives' Endowment Association, did not immediately respond. It has previously said DiGaudio 'was simply trying to get to the truth' and wasn't trying to influence the investigation.